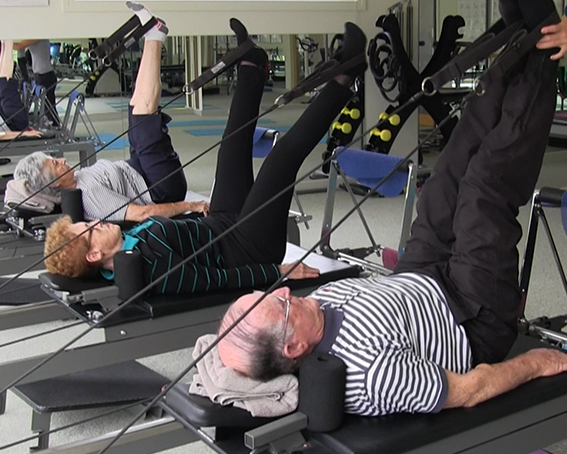 Clinical Pilates is used by our physiotherapists to treat a wide range of injuries and conditions including musculoskeletal injuries, lower back pain and stiffness,, post-surgical rehabilitation, generalised weakness and poor balance. It is also utilised to enhance performance of recreational and elite sports people. The exercises aim to balance the strength and flexibility of particular muscles to create and maintain a body that works efficiently in order to treat and prevent injury. Due to the individuality of the exercises prescribed, it is safe and effective for clients of all ages and walks of life. Is Clinical Pilates for me? Establishing a regular pilates routine builds core strength and keeps your body strong, enabling you to cope with daily activities. After injury or surgery muscle function is compromised, causing weakness. Once the injury has been treated the muscles need to be retrained. Clinical pilates is a safe and effective technique for exercising, strengthening and restoring coordinated muscle recruitment. Excellent supervision is guaranteed with a physio in charge.